Brown University physicists have set the strongest limit for the mass of dark matter, the mysterious particles believed to make up nearly a quarter of the universe. The researchers report in Physical Review Letters that dark matter must have a mass greater than 40 giga-electron volts. The distinction is important because it casts doubt on recent results from underground experiments that have reported detecting dark matter. If dark matter exists in the universe, scientists now have set the strongest limit to date on its mass. In a paper to be published on Dec. 1 in Physical Review Letters (available in pdf), Brown University assistant professor Savvas Koushiappas and graduate student Alex Geringer-Sameth report that dark matter must have a mass greater than 40 giga-electron volts in dark-matter collisions involving heavy quarks. (The masses of elementary particles are regularly expressed in terms of electron volts.) Using publicly available data collected from an instrument on NASA's Fermi Gamma-ray Space Telescope and a novel statistical approach, the Brown pair constrained the mass of dark matter particles by calculating the rate at which the particles are thought to cancel each other out in galaxies that orbit the Milky Way galaxy. "What we find is if a particle's mass is less than 40 GeV, then it cannot be the dark matter particle," Koushiappas said. The observational measurements are important because they cast doubt on recent results from dark matter collaborations that have reported detecting the elusive particle in underground experiments. Those collaborations  DAMA/LIBRA, CoGeNT and CRESST  say they found dark matter with masses ranging from 7 to 12 GeV, less than the limit determined by the Brown physicists. Independently, the Fermi-LAT collaboration arrived at similar results, using a different methodology. The Brown and Fermi-LAT collaboration papers will be published in the same issue of Physical Review Letters. Physicists believe everything that can be seen  planets, stars, galaxies and all else  makes up only 4 percent of the universe. Observations indicate that dark matter accounts for about 23 percent of the universe, while the remaining part is made up of dark energy, the force believed to cause the universe's accelerated expansion. The problem is dark matter and dark energy do not emit electromagnetic radiation like stars and planets; they can be "seen" only through their gravitational effects. Its shadowy profile and its heavy mass are the main reasons why dark matter is suspected to be a weakly interacting massive particle (WIMP), which makes it very difficult to study. What physicists do know is that when a WIMP and its anti-particle collide in a process known as annihilation, the debris spewed forth is comprised of heavy quarks and leptons. Physicists also know that when a quark and its anti-quark sibling annihilate, they produce a jet of particles that includes photons, or light. Koushiappas and Geringer-Sameth in essence reversed the annihilation chain reaction. They set their sights on seven dwarf galaxies which observations show are full of dark matter because their stars' motion cannot be fully explained by their mass alone. These dwarf galaxies also are largely bereft of hydrogen gas and other common matter, meaning they offer a blank canvas to better observe dark matter and its effects. "There's a high signal-to-noise ratio. They're clean systems," Koushiappas said. The pair analyzed gamma ray data collected over the last three years by the Fermi telescope to measure the number of photons in the dwarf galaxies. From the number of photons, the Brown researchers were able to determine the rate of quark production, which, in turn, allowed them to establish constraints on the mass of dark matter particles and the rate at which they annihilate. "This is the first time that we can exclude generic WIMP particles that could account for the abundance of dark matter in the universe," Koushiappas said. Geringer-Sameth developed the statistical framework to analyze the data and then applied it to observations of the dwarf galaxies. "This is a very exciting time in the dark matter search, because many experimental tools are finally catching up to long-standing theories about what dark matter actually is," said Geringer-Sameth, from Croton-on-Hudson, N.Y. "We are starting to really put these theories to the test." Tim, if you think dark matter is anti gravity matter then why do the anti gravity particles hang around regular matter galaxies? The gravity should 'roll' them downhill at very high velocity away. If DM is WIMPS then they should be gathered in the centre of stars right? They would increase the mass of the star until it was unbalanced and went supernova. If DM was WIMPS we would likely see more supernova, unless WIMPS are their own anti-particle (is this known or just postulated to solve the supernova problem?). If DM is its own anti-particle, and it produces photons as part of its annihilation chain, then those photons should be clearly visible in the DM auras of colliding galaxies, has this been observed? ...dark energy, the force believed to cause the universe's accelerated expansion...they can be "seen" only through their gravitational effects. So apparently the Hubbel constant is actually anti-gravity? I guess equal energy photons could annihilate if they were 180 degrees out of phase. Just choose the right inertial frame of reference, and they'll have the same energy. seems unlikely that they would always be out of phase in the observers frame of reference, also contradicts the research in the article where they measured gamma rays from the galaxies to count back to DM (clearly the researchers dont think DM photons are out of phase 180 degrees in our frame of reference). Not sure how they came up with a baseline for non-DM quark production and hence gamma rays, how did they know what was DM and what was something else? I just dont think DM is particularly consistant with observations, at least not WIMPS. MACHOS dont seem quite so unlikely, but it still think its both just epicylces (bring on Copernicus 2.0). typicalguy Yes exactly. Anti-gravity matter is repelled from normal matter and spreads out fairly evenly throughout deep space. What we are detecting is a local reduction in the density of anti-gravity matter where the galaxies are. It's a double negative. It all fits perfectly with the predicted non-existence of WIMP dark matter. The scenario of MACHO dark matter in the Galaxy and neutrino dark matter in galaxy clusters explains a host of observations. In fact, for the Galaxy the dark matter must really be baryonic, to explain the 15 K minimal temperature of "dust" clouds in the cosmic microwave FOREgrounds, and to explain mysterious radio events of which about every second a new one starts in our surroundings. SAVE EARTH PLANET-SEARCHING MINDS-GUIDING SPIRIT. The Cosmic Puzzle attracts Scientists, Amateurs, Philosophers and all mankind in search of divinity of the Human Being. "If for the sake of argument a dark matter particle's mass is less than 40 GeV, it means the amount of dark matter in the universe today would be so much that the universe would not be expanding at the accelerated rate we observe,"
meaning, I guess, that the less mass the more DM? What you may be seeing is large jets of positrons like those emitted from BHs. Positrons, being anti-matter, may very well be repulsive (anti-gravitational). I don't expect that anti-matter is anti-gravity matter. There's far more agm around than normal matter so the baryon asymmetry problem would apply in reverse. My guess is neutrinos. I think there's more empty space around than normal matter and it seems to experience anti-gravity as it expands. That would seem to fit your description of anti-gravity matter. I don't expect that anti-matter is anti-gravity matter.... My guess is neutrinos. Dark matter may contain many antineutrinos and it plays well with superluminal motion of neutrinos observed recently. rawa1 Most agm is cold and moves slowly. During time many hypothetical particles were proposed as the probable constituents of dark matter by various theories. I ordered them by their average rest mass, which differs in twenty(!) orders of magnitude: scalar field, quintessence, mirror matter, axions, inflatons, heavy photons, fat strings, sterile neutrinos, chameleon particles, dark fluid and dark baryons, fotinos, gravitinos and WIMPs, SIMPs, MACHOs, RAMBOs, DAEMONs and micro-black holes. This finding may help to falsify some of them. At big bang 100% of matter was light. Since then matter decayed (decay is result of time in 3D space). As time passes more and more matter will go "dark". Today (14 billion years in) matter has become quite stable. There should be a long period of hadron dominant matter to come. 10% of the matter today is regular (like us) while 90% is "dark". In an infinite number of years 0% of matter will be regular while 100% will be dark. Why infinite? Thermodynamics, it takes infinite space in order to reach absolute zero. The universe will forever be, but it never is as it is now. The universe is everchanging. Darkmatter is result of decay of matter and a derivative of growing space. As space grows there is more space for matter to release photons into. The more photons matter releases the less energy it has and more it decays (weakening of force). This decay is present and dark. "What physicists do know is that when a WIMP and its anti-particle collide in a process known as annihilation, the debris spewed forth is comprised of heavy quarks and leptons. Physicists also know that when a quark and its anti-quark sibling annihilate, they produce a jet of particles that includes photons, or light." And they know this from what experiment on "dark matter" particles? For a form of matter that doesn't interact with normal matter electromagnetically, it is pure speculation to assume that its annihilation with its antiparticle will generate EM radiation. It just may as well generate dark energy for all we know, until we can actually unambiguously observe one in an experiment and test it. You're right Ironhorse. No dark-matter antidark-matter annihilation has been experimentally witnessed by our civilization to date. Experimentally when two opposite particles interact they burst into gamma radiation. But light is the electromagnetic force carrier. What has been shown is that when an electromagnetic particle interacts with its opposite electromagnetic particle (an anti-particle) they annihilate and produce pure energy, light. Assuming that a darkmatter particle will produce photons when it interacts with an antidarkmatter particle is just sloppy science. If neither are electromagnetic in nature what electromagnetic force would they employ a photon (the em force carrier) to carry on for them. Furthermore, darkmatter does not annihilate. Antidarkmatter is to darkmatter -what- antiphotons are to photons. They are the same. There is no difference between a photon and an antiphoton. Darkmatter doesn't have an antiparticle / or in other words / darkmatter is its own antiparticle. I don't expect that anti-matter is anti-gravity matter.... My guess is neutrinos ...Antidarkmatter is to darkmatter -what- antiphotons are to photons. They are the same. No idea Callippo. I'm just pointing out that anti-gravity matter is there and there's loads of evidence for it. Of all the contributors only ironhorse made any sense. Matter as I understand is an area of curved spacetime. I think what that means is a region of higher energy density. For example in the presence of matter spacetime is curved because it has higher energy density. Spacetime is dynamic and can be molded into various forms of matter, normal matter being of higher density and anti-matter lower density. That's only on microscopic scales. Spacetime is also dynamic on macroscopic scales, as in the formation of galaxies. Higher density areas are dark matter because they don't radiate. Also there would be lower density areas which could be thought of as anti-dark matter. And mixing them would eventually cause annihilation - that is, normal energy density. I'm sure spacetime suffered serious turbulence during the BB. I think of the BB as blowing smoke rings of spacetime in all directions, eventually leading to galaxies in areas of high energy density. Seeker2: You got many correct insights, but your posts are still incoherent. You're not demonstrating logics, just a chain of self-referencing claims, i.e. tautologies followed with link to page, which doesn't explain anything from your post anyway. If you want to convince people, use the sequence of implications: Because A then B therefore C. Only such sequence of logics is falsifiable and we could discuss about it. You should always start with acceptable fact in the sequence of such logics. If you say for example, the "BB are blowing rings of space-time in ALL directions", it has no relation to anything here, including the previous content of your post. It doesn't explain anything, it doesn't predict anything - it's just isolated idea without sense... Why should we bothered with it after then? You will be reported instead as a many other spammers here. Unfortunate threats. So what do you think matter is? So what do you think matter is? Space-time curvature, i.e. density gradient of vacuum (which is implicit answer, as the density concept considers some material environment). Dark matter can be both one large sparse space-time curvature, both system of many but very tiny ones (i.e. the particles of matter). Good points, different terminology. For example I would say energy density instead of material environment, which should be equivalent if mass and energy are equivalent. Also a good point about ALL directions. If there are a finite number of galaxies then there must be a finite number of directions. You can deduce a much more things logically from material density distribution instead of energy density distribution. For example, every one can imagine, how mass density fluctuations can collide and how the energy will follow the path of least action between them. Can you imagine it at the case of energy density? Energy is solely abstract concept, so you can imagine nothing about it. But it's theorem of relativity, you should derive it independently with our theory. Or your theory will become dependent on general relativity and if the general relativity will get wrong, your theory will get wrong as well. ...your theory will become dependent on general relativity and if the general relativity will get wrong, your theory will get wrong as well. Yes even Einstein thought he made a mistake but he was wrong. I understand GR predicts singularities in black holes. If my theory was dependent on that result it would be in big trouble. Technically I guess you could say mass is equivalent to energy but energy is equivalent to mass only in certain cases (QM states). The energy of spacetime is distributed randomly according to the uncertainty principle. It will take the form of mass only when it falls inbetween allowed QM states and the excess energy (rounded off) is radiated. Could dark matter simply be matter that no longer has an energy component, and therefore is not directly detectable? They say its energy component is 25% of the energy in the U. According to the article it is 23% of the universe. I am assuming they are talking about 23% of the matter in the universe, not the energy. It just seems that from what I have read we can only detect matter that has an energy component and can only detect energy that has a matter-like or particle component - such as in a photon or a nutrino. 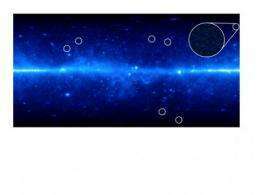 Could it simply be that dark matter no longer has an energetic component, therefore it does not react normally and remains undetectable via conventional means. Just as dark energy may not have a partical component and also remains undetectible via conventional means. If this were the case for both then I'd suppose that black holes could be stripping all of the energy from matter, including particles. Black holes may simply be condensed dark matter. If this were the case then black holes would in fact be radiating (particle-less) dark energy. But I suppose if this were so then the radiating dark energy should be detectible by its effect on other energetic sources passing by the dark energy emitter. Now, if this were the case, then black holes would be more massive than previously measured because the dark energy radiative effect (like a solar wind) would not ave been accounted for. I imagine that a photon striped of its energy would be dark, just as light stripped of its particle would also be dark. @orac: You graded all of my posts with a 1, yet you have never posted (as yet). If you are going to grade me so poorly then feel free to explain my errors. I have no problem with being incorrect - just please understand that I prefer to know more today than I knew yesterday. It's obvious by the article above that this is not settled science and a lot of resources are being expended on this learning curve. I posted a few ideas I had not seen brought up before to encourage discussion. As I had posted, I'm not a physicist, but I do have curiosity and I prefer that possibilities be discussed openly. Orac, maybe I could help you out. The energy equivalent of matter in the U is 4%. If the dark matter component was 23% of the matter component it would be less than 1%, and why would we worry? Finally there seems to be a problem with the energy equivalent of matter. Maybe E=mc^2 would help. We should emphasize this is settled science. Perhaps we should mention light is composed of photons. If a photon was stripped of its energy or light was stripped of its particles (photons) you certainly would have nothing. A few billion supernova remnants within the Milky Way galaxy would be sufficient mass to explain the Dark Matter mystery. The superstars preceding the stars of today were far more massive than their successors. After going supernova and blowing off most of themselves into space to form next generation stellar nurseries, these monster blackholes could still be greater than 1000 solar masses. The upper limit of mass for these earlier generation stars leads back to the originating big bang. No blackhole within the universe can exceed the mass of the universe. Dark Matter may be dead stars. Simply put Dark Matter could be all of the dead matter of the universe. Dead stars. Dead atoms. Yes could be. Anyway they claim it is the stuff that holds galaxies together. No galaxies, no stars. No stars, no dead stars, no dark matter. Wouldn't these dead super massive black holes be detectable by gravitationally-caused anomalies? Also, it would seem that if these are PBH's they could have absorbed the matter from whole sectors of space by now. Something else that we should be able to detect.